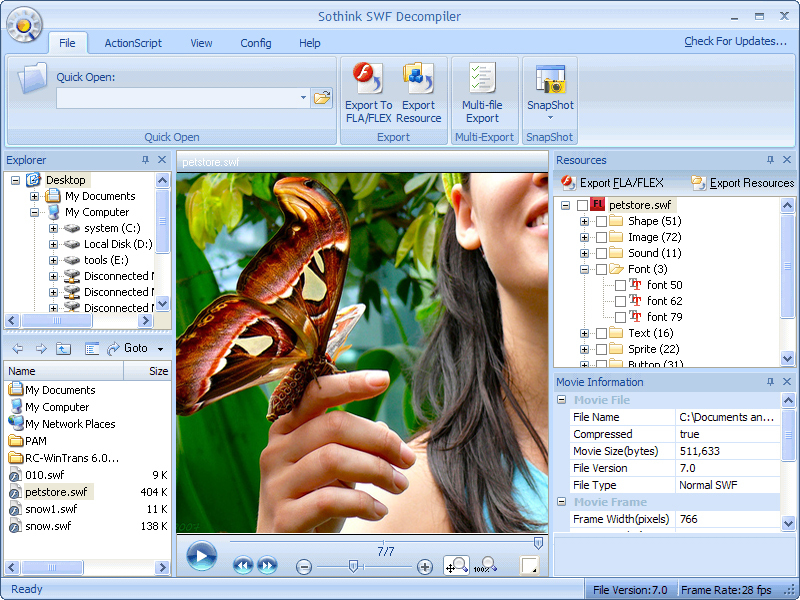 Sothink SWF Flash Decompiler can help you convert SWF to FLA or FLEX. You also can easily extract Flash resources like shapes, images, sounds (mp3, wav), videos (flv), texts, sprites, ActionScript, etc. Supports Flash 8/9(CS3)/10(CS4) and ActionScript 3, globally search all ActionScript is supported; Exports SWF resources in batch; Auto-recognizes system language; One-click online Flash capture and download; Multilingual and user-friendly. ...... Sothink SWF Flash Decompiler fully supports Flash 6/7(MX 2004)/ 8/9(CS3)/10(CS4) and ActionScript 2.0/3.0, and globally search all ActionScript is supported. A built-in Flash player is available for you to play SWF/FLV/F4V smoothly. Sothink SWF Flash Decompiler also provides a free online Flash downloader, SWF Catcher, which will assist you to capture and save Flash from IE or Firefox. Convert SWF to FLA and extract elements from SWF into variable formats. Convert SWF to FLA and export all elements in different formats. Qweas is providing links to Sothink SWF Decompiler-Flash Decompiler 6.1 as a courtesy, and makes no representations regarding Sothink SWF Decompiler-Flash Decompiler or any other applications or any information related thereto. Any questions, complaints or claims regarding this application Sothink SWF Decompiler-Flash Decompiler 6.1 must be directed to the appropriate software vendor. You may click the publisher link of Sothink SWF Decompiler-Flash Decompiler on the top of this page to get more details about the vendor.